A 50-watt explosion proof high bay LED fixture released that provides users with powerful, energy efficient illumination and includes an inline transformer for low voltage operation. Larson Electronics LLC released a 50-watt explosion proof high bay LED fixture that provides powerful, energy efficient illumination and features an inline transformer for low voltage operation. This compact, low profile LED lamp comes with explosion proof ratings, T5 temperature rating and is UL certified, making it viable for a lighting system in flammable work sites, manufacturing plants, woodshops and other hazardous locations. The EPL-HB-50LED-RT-JB2-XLV-C1D1-12.3-150-EPP provides 6,250 lumens of high quality light drawing just 50 watts. This high bay LED produces colors and details much more accurately than traditional high-pressure sodium or mercury vapor luminaries, with the help of a 5600K color temperature and a color rendering index of 75. This LED is offered in a 60 degree or 120-degree beam spread, both perfect for general area flood illumination. This light is operated with 120-277 VAC but comes with an inline stepdown transformer for 12V DC or 24V DC operation. The transformer is encapsulated for weatherproofing but must remain outside of explosion proof locations for safe operation. The EPL-HB-50LED-RT-JB2-XLV-C1D1-12.3-150-EPP explosion proof LED light fixture is IP67 rated, dust-proof, and protected against high pressure jets and temporary submersion. The cast aluminum body and LED lamp give this light durability and resistance to vibration and impacts. The housing is specially designed to dissipate heat which increases the efficiency and lifespan of the LEDs and electronics. 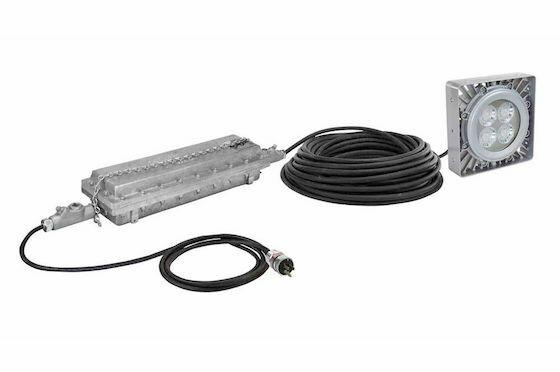 This portable explosion proof LED lighting system is equipped with 150-foot of 12/3 chemical and abrasion resistant SOOW cord that is fitted with an explosion proof cord cap for easy connection to explosion proof outlets and is supported by an adjustable trunnion mount.